As I didn't bring any paper to DD's to play with I decided to do a digi layout (my first in a looooooong time). 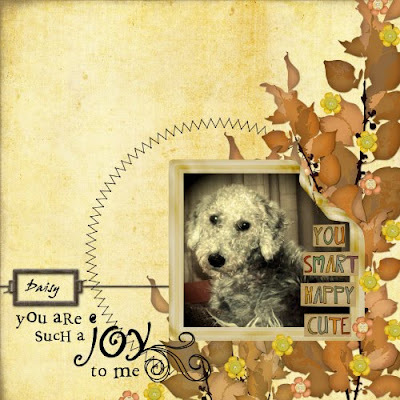 I used freebies from Shabby Princess kits and changed the colours as I wanted a vintagey look. I think I will do a few more of her as she grows to look back on. Goah what a sweet dog and wonderful LO. Our Beckys dog isjust the same!!!!!! What a cutie, and a great layout! I'll let you know when we need a sitter for Rocky, ok? rofl. She looks so cute and your LO is beautiful! I'd be taking loads of photos too! She's lovely and I see you managed to find a way to make art even with no supplies. It goes to show how few supplies you need these days to make great art. Beautiful Layout but super gorgeous doggie. What a cutie little pie your DD has got. Who wouldn't fall in love with her. Love the LO, would not have known it was digi if you hadn't told us!